ishikawa « Japan, Hockey, Baseball, etc. The Seibu Prince Rabbits, in their final season of existance, were down 1-3 in the Asia League Ice Hockey Finals against rivals Nippon Paper Cranes. Facing elimination and in front of the Cranes fans of Kushiro, Hokkaido, the team pulled through with a 7-4 win to bring the series back to Tokyo. Seibu eradicated their scoring draught which only saw them score 4 goals in the 3 straight losses in the previous 3 games. Then yesterday was another do or die game for Seibu, as the Cranes were ready to clinch the AL championship in Tokyo. The game started off chippy with 10 penalties being called in the 1st period, and it was a wild beginning too with 5 goals being scored as Seibu took a 3-2 lead heading into the first intermission. Seibu’s first goal was a nifty wraparound/bounce off goalie’s leg goal by Obara. And Prpic and Rochefort’s power play goals were perfectly executed with the players set up in the slot with passes from the goal line. We were expecting a high scoring and a rough game based on the first period (much like the first game of the series), however things calmed down in the second and the game became a tight affair. Chris Yule, of long time Kokudo/Seibu fame, tied the game in the middle of the second with a power play goal. And the game became deadlocked even though speedy Seibu forwards created many scoring opportunities by blowing past (or trying to) Cranes defencemen. They also managed to hit the post with a shot on one play. But, as things were increasingly looking like they were heading to the NHL style endless overtime (20 minute periods, sudden death), Chris Yule took a fatal tripping penalty with less than 2 minutes remaining in regulation. This gave Seibu a crucial power play at the end of regulation, and with less than 1 minute to go, captain Takahito Suzuki took the puck from the neutral zone, flew past a Cranes defenceman, neatly tucked the puck in to avoid goalie Ishikawa’s poke check and deked him out at the same time and put the puck in the net for what proved to be the game winner. Seibu 4 – 3 Cranes! The Seibu Prince Rabbits club survived to see one more day, and today is the deciding Game 7 of the Asia League Ice Hockey 2009 Finals at Higashifushimi, Tokyo. Seibu has the chance to finish their history with an exclamation mark tonight at 7pm. Some photos and videos from the game. Cranes fans also brought their big flag, this one saying 最強 (saikyou = strongest) which looks way more badass than the Rabbit logo adorned Seibu flag. 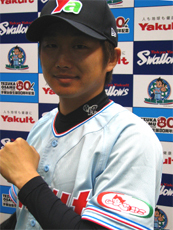 Masanori Ishikawa is delighted with the throwback uniforms too! Check them out at Jingu Stadium during Golden Week! On 31 March, at the Jingu indoor training facility, the Tokyo Yakult Swallows unveiled the throwback uniforms the team will wear during the “Might is back! ‘Yakult Atoms Revival Series’” starting on 3 May. 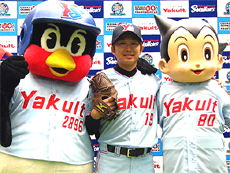 During the “Yakult Atoms Revival Series”, besides the uniforms, there will be other Yakult Atoms limited edition memorabilia on sale, and special tickets for the games, there will be many other events at the stadium for the fans, including the auction of game worn uniforms for charity. We look forward to seeing you at the stadium! See the Astroboy logo on the left sleeve! The ballcap says “Ya” and not “Ys” as usual. We hope the fans are looking forward to this uniform as well!